What is the most important point when you are writing a residency personal statement for pediatric? Right the right content and the structure. In the medical field the professionalism can be proven in different ways but for the students who only plan their career, it is limited to writing ‘why I want to be a pediatrician’ essay. 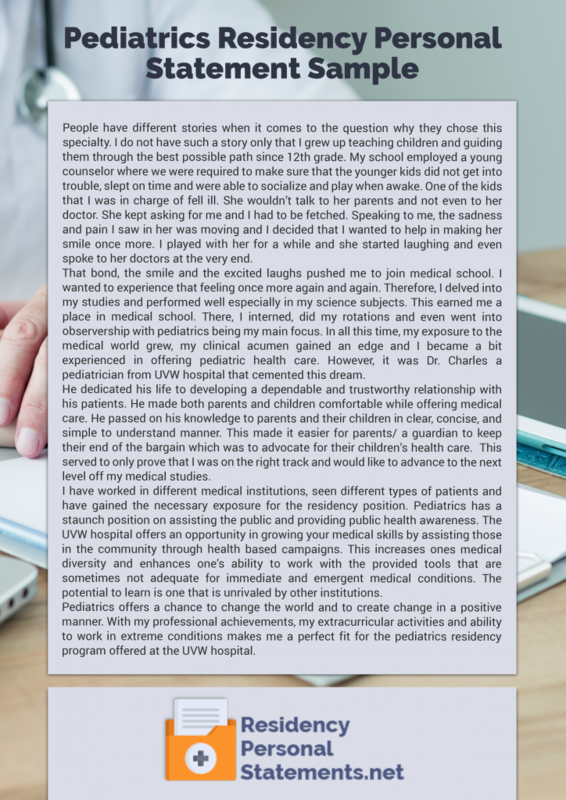 A good pediatric residency personal statement will reflect the best features of the personality that is planning to become a medical specialist, thus it will never fail to reflect: the critical thinking, the ability to analyze and synthesize the material and brilliant academic performance. We know that perfectly well, that’s why the best pediatric personal statement is can be written quickly with our professionals, just check our residency personal statements examples. Unlike many people who have completed medical school, I did not know from a young age that I wanted to be a physician. As one of those people with a natural zest for life and desire to truly impact the lives of those around me, I knew I wanted to do something to serve others. However, it wasn’t until the age of 25 that I realized medicine would give me the opportunity to serve others, work with the resilience of the human body, teach, lead, and advocate for children who need a strong guide and role model. When I began my undergraduate studies, I knew I enjoyed math and science and decided to major in chemical engineering. It did not take long for me to realize that engineering was not the right profession for me. Therefore, I decided to choose a major that would allow me to focus more on diversity and helping others, and I studied socio-cultural anthropology where I graduated with honors. At the time, I was working part-time as a personal trainer, and loved it so much that I decided to begin doing it full-time. It didn’t take me long to realize that I ultimately wanted to work in the field of health and wellness, much like I watched my father do as a physical therapist. Thus, I decided to apply for medical school in the Caribbean. This transitional point in my life was a huge blessing. Not only did I find my true calling in medicine, I also learned many life skills, became even more culturally aware, and gained the experiences necessary to determine that my ultimate goal was to work as a Pediatrician. When determining the area of medicine I wanted to focus on, I recalled working with Dr. Yellow who is a Pediatrician. She had a natural ability to bond with and educate children on their level, and it was truly motivating and inspiring to witness. She also spent adequate time working with the parents, gaining the knowledge and trust necessary to make proper decisions regarding care, and teach parents how to properly advocate for their children. She emphasized prevention and the importance of teaching children to live a healthy lifestyle and make good decisions from an early age. While working with her, I continued to learn, and I saw the Pediatrician I was striving to become. I have always loved educating youth, and have been teaching Indian cultural dance, as well as tap and ballet, for several years. I began dancing at the young age of 6 years, and was recognized as a graduate of the dance program at 14 years old, after having done an intricate 3-hour solo performance with a live orchestra. At that time, I became eligible to teach, and have been doing so ever since. My determination, perseverance, love of fitness and movement, desire to learn, and strong work ethic allowed me to accomplish this huge goal at a much younger age than most dance students. Additionally, I had the great privilege of working as a USMLE tutor after passing my exams on the first attempt, with excellent marks. In fact, I was actually hired by a local tutoring agency to help other students, which also helped me to solidify my knowledge base. I truly believe that one of the best ways to learn is to teach, and I look forward to imparting this knowledge on my young patients and their parents as a Pediatrician. I have always had the natural ability to take on leadership roles and connect with people. I am confident that I will carry these assets with me into your esteemed residency program. I have always been one of those people who accomplish what they set their mind to do, and I am determined to serve the youngest of patients as a Pediatrician. With the desire to serve, I began volunteering for the Organization BLUE at the age of 19 where I spent many hours, and by the age of 21 I was elected onto the Board of Directors. Here, I learned that it is possible to make a strong and impactful difference on society at a young age, because I did just that. I look forward to helping my patients realize this potential, and guide them to making a positive impact on the world around them. My charisma, empathy, compassion, confidence, sense of humor, active listening skills, and ability to think outside the box will make me an asset to your program. I am able to easily connect with people of all ages, and in fact, was nicknamed the “baby whisperer” during my Pediatrics rotations in medical school. I cannot imagine doing anything else with my life, and look forward to helping children forge forward with confidence by giving them the skills necessary in youth to develop good physical, spiritual, and mental health through education and a holistic and balanced approach to life. Strong opening and ending. You can start off with something interesting like the opening hook or line, you can find them on the Internet, however, if you invent them on your own it will surely improve your chances. Simple is a new cool. Some applicants are desperately trying to attract the reader with their highly academical writing tone or the intricate writing style, don’t do this – write in the simple and understandable formal manner. Also, avoid slang usage. Provide the connection. Don’t forget to match the beginning of the essay with the final part by summarizing your main points. Make sure it is brief. It is a good practice to make your admission essay as short as 4-5 paragraph narration. Cliche and stuff. Even the good essay can be spoiled by the overused citation, flat commentaries and annoying cliches, make sure they all stay away from your writing. Check spelling. Check and double check until you are 100% sure in the grammar of your essay. What Are the Features You Should Look for When Hiring the Writing Specialists? A pediatrics personal statement should be unique, chronological and logical. A statement should be strong, meaning that it needs to deliver the professionalism. A personal statement pediatrics residency needs should feature convincing examples from life that will make it persuasive. A good personal statement pediatric residency requires should reason why the candidate is the right match for the program. A good statement should be structured well and have the distinctive content blocks. How to define if the admission essay that you write will fit the medical program you are preparing for just well? There’s no certain way of finding the perfect answer, but the truth is that your pediatrician essay should be not only professional it also needs to match the program’s greatest values that a specialist must have. Top schools, colleges, and medical institutions are quite picky when it comes to selecting the best candidate, thus even if you have perfect scores in all major tests it can’t guarantee you the admission. That’s is exactly the case when the good statement of purpose can decide everything. Our writers have large experience in writing medical admission essays that makes them number one trusted choice on the internet in the field of admission medical writing. You can check out the information about selecting pediatric residency programs on our website. Clichés: “I have always wanted to be…”, “I am applying to your program…” are all common openings that will have been used many times before and must be avoided at all costs within your writing. Make your writing 100% unique from start to finish. Slang and acronyms: just because you know what something means does not mean that the committee will. Use formal English only in your writing. Also, avoid trying to be clever by selecting unusual words from your thesaurus. Complaining and blaming: this is not the place for you complain about past classes and teachers or any other slight that you may feel has hampered your progress. Always ensure that your writing is positively focused from start to finish. Not proofread: even the smallest mistake will say to the reader that you did not take care with your work or that you were not as interested in your application as you say you are. Either way they are unlikely to select you if your writing is not perfect. Professionals from our best residency personal statement services will always work with you to ensure that the quality of your statement will be at least as good as our sample pediatric residency personal statement if not better. We offer unlimited revisions to ensure that your statement will be exactly what you want and our experts will work directly with you so that it reflects you perfectly. Make sure you made the right choice with our pediatrics residency personal statement sample!